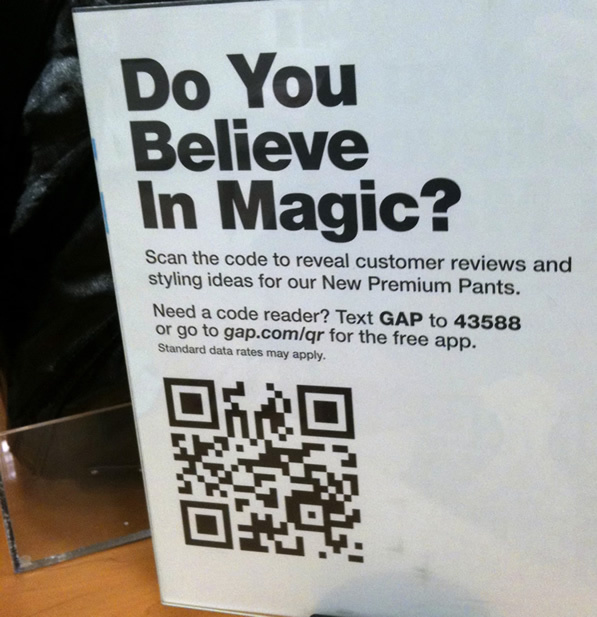 QR+RETAIL=Killer App or App Killer? Is anyone old enough to remember Merry-Go-Round clothing store? If you are old enough to remember, you’ll probably chuckle when I say it was my first job right after I quit Burger King at the tender age of 16. I LOVED working in retail. You should have seen my skinny tie and bandanna collection! I went on to manage Benetton stores all through college (this is the 80’s folks – United Colors of Benetton, remember? ), then later worked for The Limited stores. I STILL LOVE RETAIL! In fact, I can outlast my tween daughters on a day at the mall! I also LOVE digital. So a couple of years ago, when I first heard about Augmented Reality(AR) apps and saw QR Codes and glyphs in action, my first thought went straight to how they can be used in a retail environment. What is commonplace today in Japan is shaping the vision of the future in the U.S. with great videos showing how the analogue and digital worlds can be integrated into a unified user experience. Great right? Well not exactly. NooooOOoooo…. what a let down and major #fail. So we’re not quite here yet are we? But it did start my wheels turning? What are the killer apps for QR codes in a retail experience? It’s easy to go with a simple link to a product page. But what are you going to ask me to do next? Give me social tools to share my adoration for this product. Let me save this in a favorites list that I can refer to later or email to my Aunt Helen as a hint for my birthday. Think and engage! Don’t use QR codes to show them 5 angles of the product they can hold in their hand. Give them details that will help inform their decision and feel smart about their purchase. This is your chance! Your customer clicked on the QR code indicating interest. 100 clicks on product A, but only sold 1 today? Why?? They are holding their mobile device and in the perfect scenario to provide you feedback. Ask one question – “do you like this? yes/no”. Feeling lucky? Ask “why/why not?”! Feed this data back to your buyers. Just imagine the data you could capture if this was a branded app where you know the demographic profile of the respondent! WOW this can be powerful. It was interesting to me that I had to think before I scanned! Me, the uber geek was contemplating NOT scanning a QR code. I have to admit, I felt like a dork scanning a QR code and it was only worse that I had to kneel down to do it. Place codes at eye level for signage. Train the staff on what the QR tags are. Give them talking points at two levels for the novice and the expert. This becomes part of your brand experience. You NEVER want to have your associate say “I don’t know” even if it’s NOT a sku. Use the QR Code to launch to the video of the TV spot that features the product their holding in their hands and vice versa. Use QR codes on print ads with a call to action the rewards the customer with a promotional offer then list nearby stores based on their location. And if you REALLY want to get crazy think about linking location based systems (LBS) such as Foursquare, Gowalla and even now Facebook Places. Why not have them checkin via QR code? Email marketing is not dead! Ask for their email address and reward them with an offer that they can redeem in the store at that moment! What do you think the redemption rate of that coupon would be? What was your cost of acquisition and the lifetime ROI of that one simple click?? Think of new places to put QR codes. Put them on the price tag with product specific information. Heck, put them on the LABEL. When that tween goes home after a day at the mall, they invite their friends over for an impromptu fashion show! Empower their friends to scan the tag then snap photos of their friend wearing that item to share. Just imagine them posting their new outfits on DailyBooth.com holding the price tag w/ the QR code. Their friends can instantly scan and engage the exact product with the nearest store location. Most people will walk by and never notice the squiggly squares. Talk up the codes! Tell your customers about QR codes and why they will enhance their shopping experience. GONE is the day of “can I help you find something?”! When I was in the dressing room today, I needed a different size shirt. How amazing would it be if I could scan the QR code on the price tag to see if the RIGHT size was even in stock? Make the QR code a customer service tool, NOT just a marketing tool. Don’t put you QR Codes knee level!! Admittedly, QR Codes can be borderline gimmicky. Think gimmick, you’ll get gimmick. But on the other hand if you can think of ways that ENHANCE the brand experience in a very simple way you can bridge the analogue world with the digital to build loyalty, engage, spark dialogue and spread word of mouth. What do you think? Are there any great application of QR codes you can share? Posted on August 30, 2010 June 7, 2017 Author Categories Best Practices, Digital Strategy, Mobile, QRTags Mobile, QR Code, QR Codes, Retail3 Comments on QR+RETAIL=Killer App or App Killer?